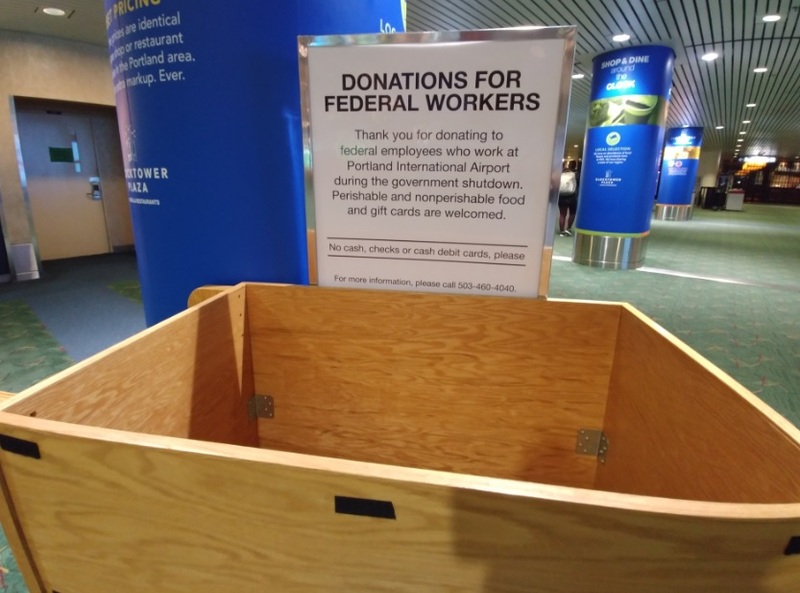 Ina sign of the times, on Thursday the Portland airport had a box accepting food donations for federal airport workers and by Saturday it was taken down as the shutdown ended. The Willamette Week reported that almost 2,000 federal workers in Oregon have applied for unemployment benefits because of the partial government shutdown. As the shutdown enters its longest in U.S. history, a third of Oregon’s federal workers have failed to receive paychecks, forcing them to seek help from food stamps, charities, and unemployment. The Oregon Employment Department stated that nearly 9,600 federal workers weren’t receiving paychecks, including 3,335 in Portland alone. Since the shutdown started Dec. 22, the number of federal workers in Oregon seeking unemployment is 1,900. The shutdown has left nearly 200,000 acres of land in U.S National Parks unattended, including nearly 1,000 miles of hiking trails. Ninety air traffic controllers in Portland who are owed $562,500 in gross wages have filed a lawsuit against the Trump administration. Certain federal workers who worked without pay are expected to receive back as the funding is restored.